Eagles return loaded squad, while hopes are high at Gardiner, Nokomis and Messalonskee. There was shock and surprise from the Erskine golf team when it saw the scores coming in at last year’s golf championships and realized it had brought home the Class B state championship. And coach Mark Bailey knew some other teams around the state were feeling the same way. “No question, we snuck up on people,” he said. That won’t be the case this season. Erskine’s taking aim at another state title, and this time, everyone will see the Eagles coming. Erskine went toe-to-toe with Class B’s traditional powers, the Cape Elizabeths, Old Towns and Yarmouths of the division, and it should be back in the mix of contenders with an enviable amount of returning talent. Aaron Pion, Connor Paine and Justin Browne had Erskine’s top three scores at the team championships, shooting 77, 80 and 80, respectively, and all are back to try to lead the Eagles back to the top of the list. It’s a good spot to be in, but Bailey pointed out that it’s not an identical one to last year. Robert Harmon graduated and took his 80 in the state championship with him, and finding his replacement is Erskine’s mission for the fall. Most of the golfers vying for that spot are new to high-stakes competition. Kay Grady got into some matches last season, Noah Labbe played JV and Seth Savage and Noah Bonsant are new to the team this year. It’s a wide-open race, and Bailey said the three at the top have taken it upon themselves to help the players that are looking to provide the depth. Erskine won’t be the only area team eager to contend. 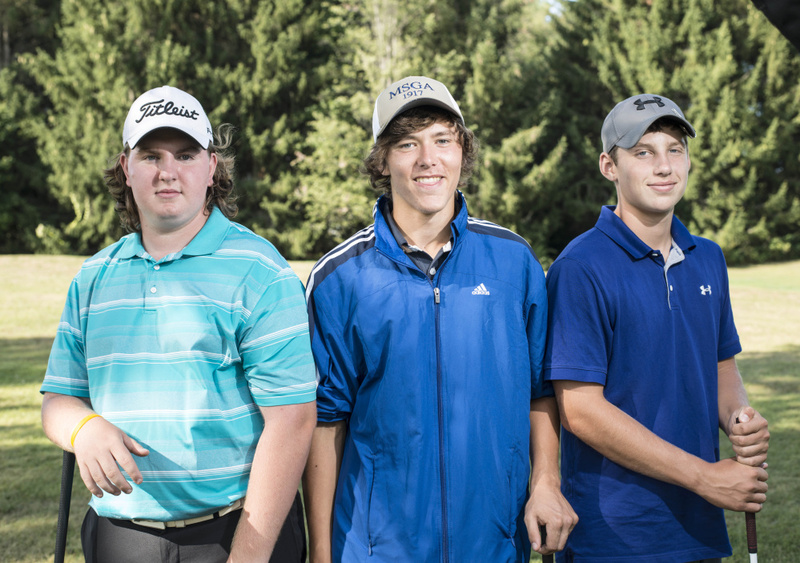 Gardiner returns three of its top four players from last year, including its top two in Cody Rizzo and Cam Bourassa, and it also has a new coach in PGA professional Chad Hopkins, who sees room for the Tigers to improve after finishing ninth in Class B last year. Nokomis took a leap forward last season, going from an 0-7 record to a 6-2 mark, and coach Matt Brown said the team has its sights set on continuing the progression to states. Few in the KVAC are deeper; junior Sam Smestad can score in the high 30s, and seniors Josh Smestad, Zach Hartsgrove, Josh Perry, Kobe Ramsdell and Josh Emery, as well as freshman Lindsay Cote, can all get into the low 40s. Waterville finished a place behind Gardiner and has its top two golfers back as well in David Barre and Cody Pellerin. Oak Hill has only five golfers on its roster, but its group, led by high-30s scorer Cohen Donnell and low-40s shooter Jonah Bergeron, is a talented one. MCI took a hit with the departures of Class B individual champ Eric Dugas and Carter Pearl, but will look to stay in the running for a state tournament bid by leaning on returners Avery Gosselin and Anna Smith. In Class A, Messalonskee is poised for a strong season after bringing back Blake Marden and Jake Bernatchez, both of whom qualified for the individuals last year, finished tied for 13th and tied for 18th, respectively. The Eagles, who will play mostly Class B opponents after the MPA tweaked schedules to cut down on travel, have a senior-laden roster that will also be led by Conor Ferguson and Parker Poulin, who helped guide Messalonskee to 10th in the state. Cony, like Messalonskee, will play new teams and look to improve on last year’s 4-4 record. Jake Whitley and Tyler Dostie will be the top scorers for the Natanis-based Rams. Lawrence, led by a strong No. 1 in Matt Brown, will seek a winning mark after going 3-6 a season ago. One of the strongest teams in Class C will be in transition this season. Winthrop, which won the Mountain Valley Conference championship last year, took third in states and has been a consistent contender, lost its top three golfers last season and will look to groom last year’s depth into this year’s scorers. Ben Thomas, who was fourth or fifth last year, will be the top man this year, while Zac Pray and Brad Bourne will go from playing in exhibitions to being counted on to win matches. Forest Hills will look to defend its East/West Conference title while playing for individual honors for its top golfers. Carson Veilleux has played extensively this summer and will look to be near the top of the pack in the individual tournament, and Elise McKendry will look to qualify for and play well in the girls individual tournament.